On Wednesday, May 2, trailer music supervisor, Natalie Baartz, Music Director at Ignition Creative, spoke to our group, listened to songs and gave feedback. 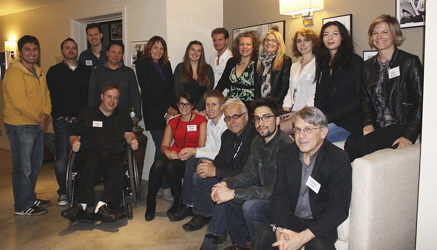 This was the 7th in NARIP’s 10-part series with Trailer Music Supervisors. Here’s a synopsis of the evening’s information and pitch session. All projects are different, and all work from a different place. It can sometimes start with reading a script and thinking of ideas in that way or getting a film that is completely finished and in need of music. Sometimes clients have a very specific direction for the music that they want, and sometimes the client comes in completely blank with no preconceived notions. The target audience and demographic are things to keep in mind when selecting the music. There is always a need for covers, which is one of the specialties of Ignition Creative, mainly because through covers you get the biggest demographic because it makes the trailer recognizable. The challenge is to do a song or theme that is recognizable but at the same time unique and fresh. Re-imagining the song is the thing to do, then. Recognizable music in a trailer may not make it more powerful, but Baartz thinks it will make people notice it more. Ignition Creative, the company where Baartz works, definitely does – as its name suggests – a lot of male-oriented movies. Ignition Creative is also the trailer house that people go to for a more edgy and out-of-the-box version of a trailer. They usually do the risky, racy, R-rated trailers, which makes sourcing the right music extra hard for the music department, which manages to get the job done with only four people. The entire company employs approximately 250 people. Counterpoints are opposites for dramatic effects. Baartz mentions The Battle Of Los Angeles trailer as a reference for music supervisors right now regarding counterpoints. The trailer shows war scenes while the music is an emotional, ethereal piece which doesn’t seem right for action and war but somehow it fits with the visuals and makes it powerful. Baartz mentioned that studios get really scared of anything with religious overtones or lyrics because these references eliminate a certain demographic. God references scare studio marketing executives. This definitely comes up a lot, according to her. During the session, Baartz mentioned that she files almost every song pitched. She puts them in folders according to genre and/or feel. She mentioned that she maintains the following folders: fun, comedy, counterpoint, action, jazz, great trailer music, moody, rock, rom-com, twangy, spy, electro, good energy and dark cool. These folders help her to select music more easily for future projects. • Metadata should be complete with song title, artist, all writers, contact info for all owners. Also on CDs! • Instrumentals should always be available. • Do what you think is best, send stuff you really thinks suits the brief. • Don’t send more than five songs for a brief. • Watch movie trailers on apple.com. • Typically she needs tracks that build and get really big, or for comedies they should have a great energy and have good stops and starts. • Don’t keep calling to check on the status of your submissions. Music supervisors are very busy. • Deadlines are always extremely tight. The first person who sends music normally gets pitched to the editor. Normally they have to turn a pitch around in an hour and a half. • If the deadline has passed, don’t send music. • Don’t pitch a song that’s already been in a trailer, since they rarely get selected. • Being available on iChat can be helpful, that way it’s possible to chat away while Natalie listens and works. • Avoid asking what the project is if Natalie hasn’t been specific. Her job is very competitive and they are technically not allowed to divulge project details. • “Awesome, I knew it would work. Theme relates to many projects,” she said of the track, Workin’ Man’s Blues, performed by Aceyalone featuring Cee-Lo, submitted by North Star Media’s Molly Bohas. • “That’s something for intros, mids, stuff we always need for comedies. It’s exactly right with stops, whistles, woo-hoo’s, they (editors) love that,” she said of Matthew Doughty’s The Dark Keys Guitar Tango. • “Love the vibe, has potential for a TV show promo,” Baartz commented on the submission that Tricia Howell presented, I Remember. • “A song that wouldn’t work for tons of trailers, but it would be perfect for that one,” she said about Walk Beside Me, pitched by Barry Gremillion. • “Do you write for trailers? It’s the perfect structure for any action hero movie, that theme comes up over and over again,” she said on the track that Chris Levy presented, Save Me Now, performed by his band Son Of Levi. • “I would pitch it for ‘G.I. Joe 2’ TV spots right now,” she said about Raunch City by Texas Terri Laird. • “I love the clock, it’s cool for a drama thriller. I would definitely pitch it,” Baartz said about Phases performed by Hen Ree which was presented by Jürgen Korduletsch. • “I would totally use that for a cool, edgy, romantic comedy,” she said of Never Made It To The Bedroom by Loren Francis submitted by Nineteen95 Artist Mangement’s Gigi Sotomayor. • “You said it was a slow build but that’s kinda all you need for a romantic drama trailer. It has a good anthemic chorus,” she said of Don’t Forget To Breathe from Julie Austin, representing Christi Warr. The seventh in NARIP’s Trailer Music Supervisor Sessions series, this intimate session enabled registrants to prepare pitches in advance, meet Natalie face-to-face, have her listen to their music and receive immediate feedback. In some instances, attendees were able to tailor tracks to better suit Baartz’s immediate needs and be more “on brief” and therefore much more likely to be placed. A music supervisor for over 9 years, Natalie Baartz is Music Director at Ignition Creative where she manages the music department and is in charge of all music for all projects. As well as pitching a huge range of commercial artists, she also works closely with composers, DJs, and remixers to do custom scores (orchestral to dubstep). While at Ignition she has been responsible for such high profile campaigns as Martin Scorsese’s Hugo Cabaret, Spielberg’s Tin Tin, 2011 Sundance winner Like Crazy, Super 8, Devil’s Double, Another Earth, 30 Minutes or Less, Fright Night, Transformers 3, Battleship, to name a few, as well as multiple prime-time television show campaigns, most recently HBO’s Luck. Prior to Ignition Creative, Natalie worked for four years as a music supervisor at the Ant Farm trailer house, selecting commercial music and working with composers on scores for movie campaigns, building a foundation in dealing with the marketing departments of all of the major film studios. She worked on several prominent campaigns including Warner’s, Where The Wild Things Are (garnering the Golden Trailer Award for Best Music with Arcade Fire), Sony’s, Julie and Julia, and Eat Pray Love, (which set Florence and the Machine on the map with the use of Dog Days Are Over); Universal’s, It’s Complicated, Paramount’s, Iron Man, Star Trek, Transformers 1 and 2 and The Reader for the Weinstein Company. While at Ant Farm she also supervised numerous video game trailers. Prior to getting into entertainment advertising she spent four years working with independent music supervisor, John Bissell, where she started as an intern and was eventually promoted to music supervisor. During her time with Bissell, she worked on studio and independent features including Ladder 49, Lord of War, You Kill Me, The Architect, 10th and Wolf, and Junebug. Natalie completed her Bachelor’s Degree in Film and Media at the College of Cheltenham in England before moving to Hollywood to pursue her music supervision career. Her main passion is Composers and Film Score, and she constantly seeks new, innovative composers for her projects.